Educate and impact sales associates at key retail accounts and convert them into enthusiastic torch-bearers for two of JVC’s most innovative technologies. Engage and educate consumers during high traffic times at stores on these same technologies. 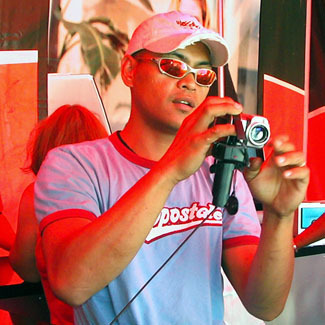 ZAG created a modern-day “whistle stop” tour for the JVC brand whereby two, 45’ customized, concert tour buses and fully trained teams traveled simultaneously to participating stores rallying the sales troops and providing hands-on experience & training with the featured products. 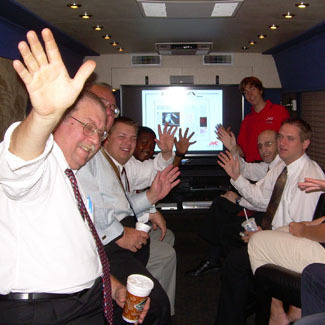 The buses were converted into mobile training facilities and traveled to as many stores as possible during a 100 day product launch period. 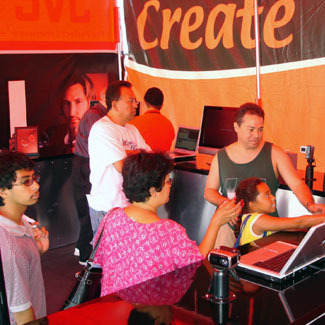 A 20’ x 40’ branded pavilion was also constructed outside the bus to accommodate large crowds of consumers giving them an educational experience in a relaxed, uncluttered and relevant way.